I'm an aspiring Life/Personal Development Coach, and this podcast is going to be about becoming the best version of yourself in ALL areas of life, not just 1 area. Ep 16: We Talking SPACE! Ep 14: Spiral Dynamics - Which Colour Are You?? Episode 12: New Years Resolutions. Are You Making/Keeping Them The Right Way? The new year is upon us, and this is the time where resolutions happen and people tend to either keep them, or fall off. Right off the bat, we know that you don't HAVE to wait until this time to year to come up with resolutions. Btw, I'll put in the timestamps when my loud and hearty laugh happens, just incase you just want to listen to that... Lol We look into different things.... -What makes a good resolution -Why people stick with it, or fall off -How you should go about creating these resolutions -Doing a self audit -The mind, and it's part to play in your world That being said, we know you'll enjoy the podcast and it'll change your perspective on this whole new years resolutions extravaganza. Visit madmindcoaching.com for your free e-book, and blogs about life topics that you may have thought about, or been curious about. :50 - Don’t have to wait until New Years 1:20 - Resolution you can stick with 4:20 - Addressing something in life that I wanna change, how do I go about doing that?? 8:24 - My crazy laugh / audit of your life 11:10 - Make your mind your b**** 12:00 Affirmations / cue cards 16:00 - LOF - Does it work?? (Law of attraction) 20:00 - Going over a resolution / barriers we put up/ self sabotage 30:00- Intentions / trust / weather. Are you going to let it get to you? 32:20 - Eat your feelings / Mindset/ LAUGH!! :) 40:00- There’s no way around it, it’s hard work and dedication. Sometimes it’s not fair - the way things work. 45:00 - When you start to eat right, and have good gut bacteria, your body reacts differently to other foods you haven’t had in a while (pasta, subway, fast food, etc…) Change your normal, to feeling optimal. And this goes for life goals as well. You should feel great about your body, mind, life, soul. 48:10 - Kraft dinner. We all have our moments. Melissa getting cinnamon rolls. 50:00 - Podcast cut off, and we started up again! When we have days where we feel “off”, then that’s okay. No one is going to feel great all the time, but it’s about the overall. Well aligned with what you want. Congruent with your value system. 54: - Doubling financial income People not appreciating where you’ve gone in your life, or where you’re going. 59:50 - Jon totally spacing out towards the end. Listen to this, cuz it’s unexpected, and I laugh like crazy. Ep 11: Anxiety In It's Different Forms. How Do You Best Deal With It? Ep 9: What Drives People To Change? What Drives YOU? It's normal to want to be perfect, and get everything right. But is it an advantage to you, or is it becoming detrimental? Jon and I dive into what perfectionism is, our own experiences with it, and how stepping back a bit can help you get to the things you want. Both Jon and I have had that "perfect" image in our minds when it came to our bodies, until we all of a sudden realized, why stress so much about this? Why not just do the best you can, and keep going about it that way? We hope you enjoy listening in, whether it be in the car, or at home while cleaning up the kitchen. 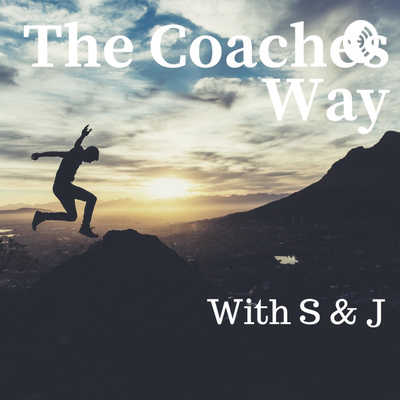 In this episode, Jon and I discuss what NLP is, how it can benefit us coaches to help out our clients (you! ), and why something so simple can be so beneficial. We also go over having a type of mindset that helps you do the things that your environment doesn't necessarily see as "safe" (like starting a business) There is also discussion on ways of coaching other than NLP, and the benefits of it, and how even the most successful people in the world have coaches, and for a good reason too. Enjoy! Jon and I discuss ways parents can implement physical activities into their day during these back to school stressful times. We talk about mindset, keeping it simple, your ultimate reason, and strategies to sneak in activity while your with your kids, or on your own. Don't let your circumstances define how you will live day to day. Hope you enjoy the listen! We go through a recap at the 26:52 minute mark. In today's society, we are bombarded with outside stimuli all the time. All this effects our internal and external conditions. This knowledge is thanks to my coaching program that I've joined for my personal development - The Healthy Wealthy and Wise coaching program. For more info, visit Wealthitforward.com In this episode, I go over 4 of the questions you need to ask yourself when it comes to making a decision. This goes for any situation. -Who would you like to be? -How would you like to respond? -How would you like to feel? -What would you like to do? I go over how these conditions effect your mind. Leave a comment, a like, or a share if any of the points resonated with you. In this episode, I explain why investing within yourself is one of the best tools you can use for yourself, and for your future.